Here's Bernie Sanders encouraging Democrats to use budget reconciliation to pass health care reform if Lieberman filibusters. And here he is pushing for the government to break up financial institutions that are too big to fail. I'm sure why I don't hear more about this guy. Is he not being vocal enough? Is it that he's not a swing vote on any legislation so the media doesn't follow him closely? Is he too junior to make much noise? Whatever the case may be, I'd like to hear about him more often. Sanders is a nifty asset as far as Overton Window issues are concerned. He's formally not a Democrat, and this gives him the opportunity to push good ideas that the party as a whole doesn't really want to be associated with, but which towards which they're happy to promote half-measures. Then he can get all grumpy about how Democrats aren't socialists like they should be, but vote along with them. I understand how centrist positioning can be an electoral asset, so in some cases it's reasonable to pursue it. But of you want to be seen as a Democratic centrist, you need prominent and respectable people on your left, or nobody will see you as being in the center of anything. These people can introduce ideas that keep your votes from looking radical, and sometimes angrily call you a moderate and a non-socialist, which is what you want to be called. The Ben Nelsons of the world should understand that they need Bernie Sanders to do his thing. 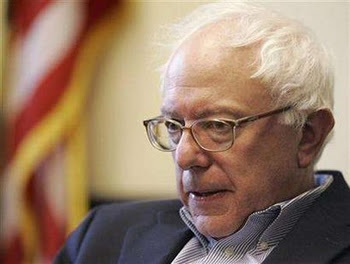 The Ben Nelsons of the world should understand that they need Bernie Sanders to do his thing. You are right about this. But one of the things I've learned in a long political life is that "centrists" never understand that they need a left or a right to legitimate them. This causes me to suspect that their "centrism" is a more a character flaw (or collections of related character flaws) than a political position.